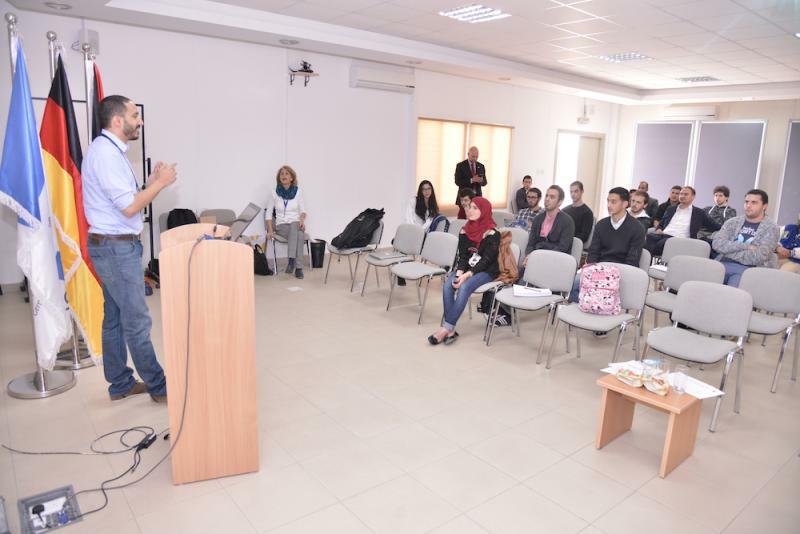 On Monday November 16, GJU’s Office for Industrial Links (OIL) and Concrete, the student entrepreneurship club at the GJU, organized the “Start and Sustain Your Business” event as part of the Global Entrepreneurship Week (GEW) activities at GJU. 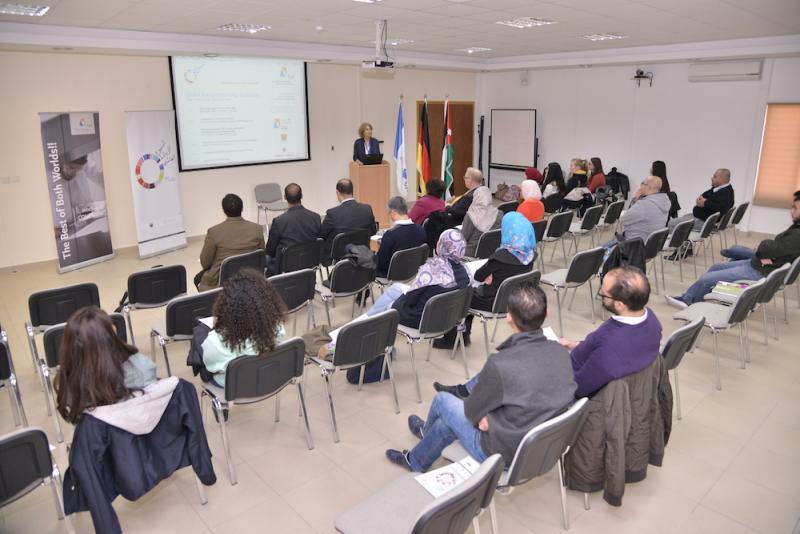 These activities fall under the Program for Innovation and Entrepreneurship (PIE) at the OIL, which aims to fulfill GJU’s vision of Education for Employment and Entrepreneurship. Britta Kähler, Director of the Office for Industrial Links and Eng. Jamil Alkhatib, Manager of PIE welcomed the participants and introduced the recent activities of PIE. The event continued with presenting the winning teams from the previous event organized by PIE, the Health Hackathon, which took place on the 12th, 13th, and14th of November. The winners were handed their certificates by vice president Prof. Manar Fayyad, on behalf of the President Prof. Natheer Abu Obeid. Each winning team gave a quick overview to the crowd about their project and how it was developed over the weekend. The event led the students through the entire journey of starting their own business, covering everything from finding the right opportunity all the way up to expansion and going global. It consisted of multiple sessions covering different aspects of startups including “Opportunity Identification”, given by Dr. John Mueller from Western Michigan University, “Forming the Right Team” by Dr. Ala’ Khalifeh from GJU, and “The Value of Mentors” given by Matthias Treutwein and Josian Smith, who also introduced the students to their mentorship program, Enpact. Dr. Mueller explained how the students should go on about finding and assessing business opportunities. "Turn problems into opportunities. Look for changes. And look for patterns that connect these changes and turn them into an opportunity", he said. Laith Shukri from Oasis500 spoke to the students about potential funding options and the criteria in which investors assess startups. GJU Alumni, Eng. 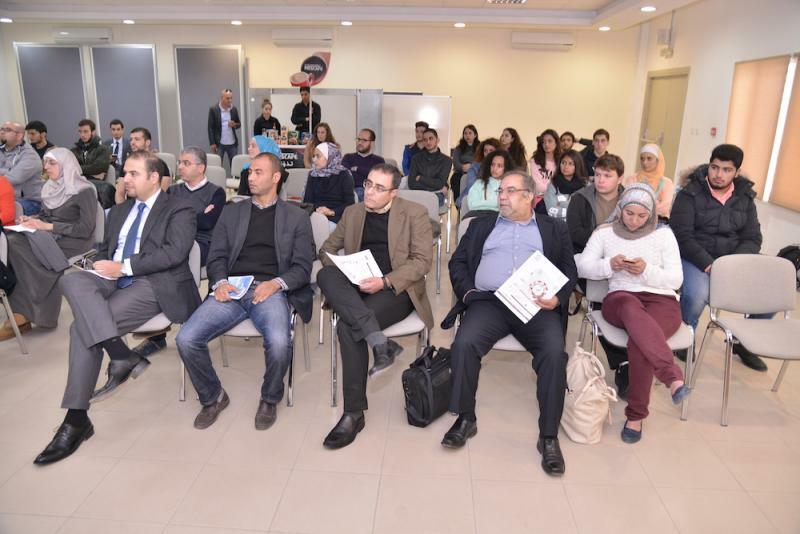 Yousef Wadi, cofounder of Arabiaweather.com, gave a session titled “Start and Grow your Business”. “You need a cofounder to start your company”, he stressed. The event wrapped up with a session given by Omar Kisswany from the Conctrete entrepreneurship club about the club’s goal and its activities. Nescafe supported this event and kept students and speakers warm and awake.